A selection of trees brought along to the May meeting. Dave Y closes the meeting with a quick game of hide and seek. This months tree of the month as chosen by Tony is this fine looking Azalea that lives in Dave Y's garden. Below is a copy of message found on IBC from Ian. 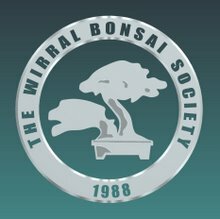 'It is with deep regret and great sadness that Wirral Bonsai Society has to announce the passing of Dave Mitchell. Dave has been an active member of the bonsai scene on both the Wirral and in the U.K. for many years. Dave passed away peacefully with his family with him on Thursday evening after a long illness. Dave was one of the quietest, unassuming, nicest people I have ever met and he will be sadly missed by all who knew him. Our thoughts go out to his lovely wife Hilary and their children, Lindsey and Craig at this sad and difficult time. I'm sure all members and everybody who knew and met Dave will reiterate Ian's sentiments. Personally I always enjoyed Dave's sense of humour, his unassuming nature and a seat next to him at club meetings.